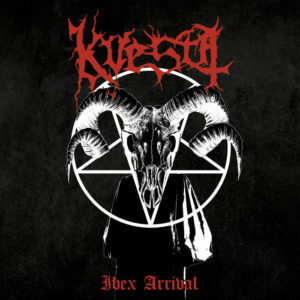 Kvesta is the continuation of a black / thrash band called Skrømt which existed for one short and badly recorded demo. The only reason why I bring this up is the difference between the Skrømt demo and Kvestas’ Ibex Arrival is leagues in terms in of production. Even the band’s 2015 EP Human Scum sounded like a completely different band who was brought into focus by a clear presentation. This is wonderful for the band as sinister and icy nature of the music swoops down like banshees on, well, motorcycles. There is little I can do to divorce the two. Songs like “Demonic Summoning Ritual”leans on influences like the obvious Aura Noir but beyond that the band manages to conjure the spirit of Santatic heavy metal, both kitschy and serious, in a sound which is both trying to scare and having the time of its life. Black / Thrash is not a sound which is very popular in the current landscape of heavy metal. This is one of the reasons why Kvesta has a leg up on the competition. Aside from the very small scene of black/speed Morothead summoners, the road is wide open for Kvesta to open up and reach top speed. I wish them luck as the arrival of the Ibex is surely to bring winds of destruction on all who get in its way.